Modern industrial production is dependent upon processes being perfectly coordinated. As a result, material flow during manufacture has become a decisive profitability driver. With its three logistics train models – FT, FT C and LT – Linde Material Handling provides tailor-made solutions to specific customer requirements in order to achieve synchronized transport of material over long distances within the company premises as efficiently and flexibly as possible. The logistics trains complement Linde's portfolio of forklift trucks and warehouse handling equipment, and comprise tow tractors that can each be combined with different trailer modules. They can be loaded with up to 2,000 kg per trailer module, and are ideal for internal transport distances of 150 m or more. 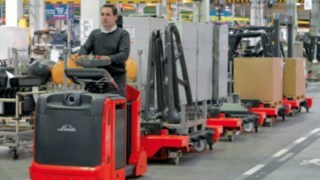 The cost-effectiveness of Linde Logistics trains arises from the standardization of the material flow, increased safety for personnel and materials, and the variety of applications that the trailer modules can handle, allowing any imaginable load or goods to be transported – whether pallets, skeleton boxes, or individual items. The easy loading and unloading handling processes, sometimes using an engaged pallet roller frame make the train equipment an effective part of any material supply chain. All Linde logistics train models are characterized by their high tipping and directional stability, and small turning circle. The main advantages of Linde Logistics trains are their rapid and accurate handling, as well as the flexibility with which the trailer modules can quickly be adapted to all types of goods to be transported within the company premises. While the LT logistics train was developed for logistics transport within production halls, the FT factory train is intended for the movement of materials over longer distances, such as between production halls. Each with a turning circle of 4.2 meters, they can be used in even the most limited spaces. All Linde logistics trains operate with a variety of loading frames, some of which have engageable dollies for transported goods, that are raised for transport using lifting equipment and then lowered again for unloading. This makes material transportation with Linde Logistic trains effective, convenient and, fast. The FT C model is a shorter, compact version of the factory train, that can be used in especially narrow areas using modern axle technology. Even where the surface is very uneven, all of the truck's wheels remain permanently in contact with the ground, ensuring maximum load stability. The five different and freely combinable loading frames of the LT model can quickly and easily accept all types of goods that typically need to be transported within the company premises. 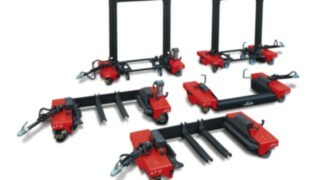 Sometimes using engageable roller dollies, they can be loaded with all standard pallet sizes or skeleton boxes. The whole train is secured with an immobilizer and cannot begin to move until all load frames have been raised. The tow tractors feature a driver assistance system that automatically restricts the speed when cornering, to help avoid tipping accidents. All Linde logistics train trailer modules are connected to each other and to the tractor via data cable. This means the driver can operate all lifting frames centrally from the cab. He can see at a glance whether all load frames have been raised for transportation. 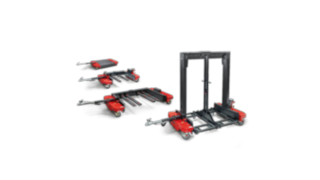 Individual load frames can also be operated by foot pedal on any particular trailer, however, and the handling system also reduces back strain. If a special weather cover is necessary for work in outdoor areas, this can easily be fitted and removed using a mechanical lever without the driver having to bend down. 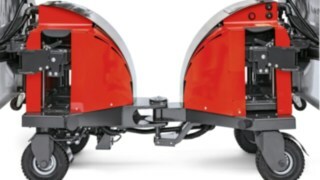 In order to be able to steer the logistics trains as accurately as possible, the trailers for the LT and FT models are fitted with either two or four steerable wheels. Even with four trailers, this allows extremely small turning circles to be achieved, for example, in the narrow space between production lines. Thanks to an optional crab-steering system, the FT C train model can be moved at right angles to the direction of travel. All the wheels of the trailer modules of Linde logistics trains feature suspension and are fitted to sophisticated tilt axles, enabling loads to be transported with as little risk of damage as possible. Plus, special directionally-stable profile wheels are available for operation outside the production hall. Freestanding items can be rolled directly onto the load frames. Using a special trailer with a bridge frame, the goods to be transported can be loaded or unloaded from both sides. All trailers are equipped with an accurate and quiet lifting mechanism, allowing the transported load to be raised smoothly, to a freely-adjustable lift height. In Linde logistics trains, the future is already built in. In digitally controlled production processes, the requirements for precision and punctuality in material logistics are constantly growing. 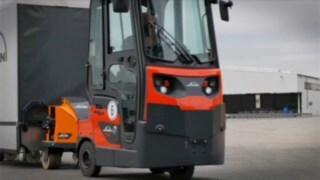 Networked logistics concepts are required, in which machines, goods, and transport systems communicate with one another to ensure that the goods are transported as efficiently as possible. The next step in this direction is logistics trains that move autonomously around production halls, controlled centrally via a powerful fleet management system. Linde logistics trains are already fitted with powerful sensors, actuators, and control systems on the basis of which appropriate solutions can be implemented. Linde logistics trains operate cost-effectively, as they can carry and move large volumes of material. This makes them ideal for use in synchronized production. Linde logistics trains are equipped with an immobilizer for safety: The trains cannot be moved unless all load frames in the trailer modules have been raised. Lifting up to 8,000 kg, the logistics trains move a great deal of material per operation, making them a particularly economical option for intralogistics. The Linde logistics trains are kitted out with suspension and a smooth lifting mechanism, enabling them to move loads gently around the company premises. 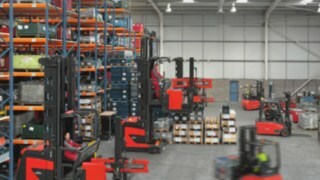 Linde logistics trains provide maximum comfort in the workplace. What's more, the lift mechanism of the various trailer modules can also be operated by foot pedal. No two Linde logistics trains are exactly alike. 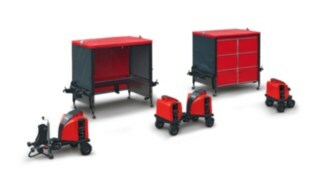 In addition to standard equipment, each of the three models can be supplied with a selection of additional features that go far beyond just optional weather protection for the various trailer modules: The crab-steering system required for the sideways movement of the complete train is one example of special equipment, as are special guard rails where load frames are used particularly intensely, or even special paintwork in colors other than the Linde red. Optimal synchronization: The LT model series logistics trains ensure efficient material flow in production. In the restaurant Giggijoch you can order fresh cakes, yeast dumplings and strawberries at an altitude of 2,283 metres and an outside temperature of minus 12 degrees in the Ötztal Alps. 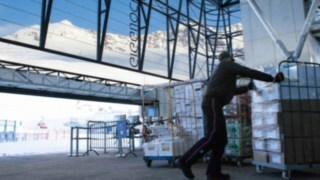 A Linde tugger train supplies the mountain restaurant in Sölden with fresh food every day.